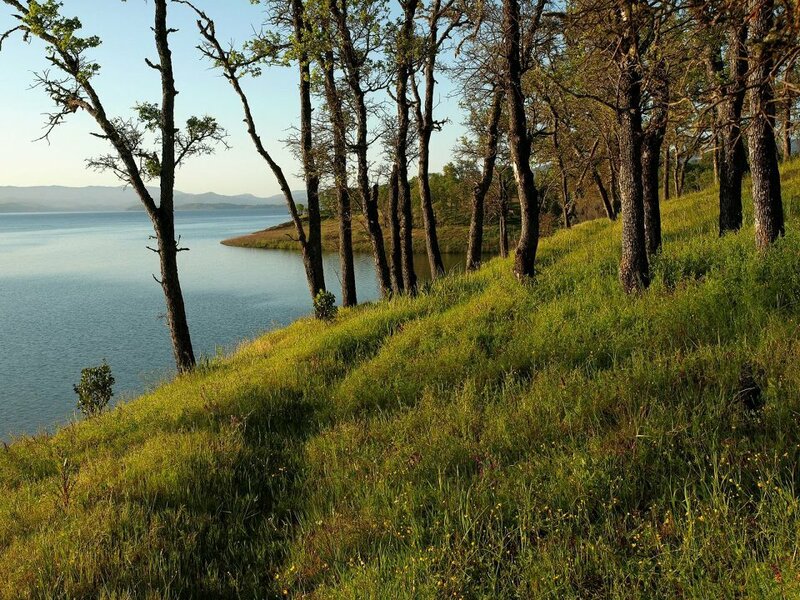 The east shore of Lake Berryessa is an undeveloped wildlife area backed by cattle ranches. A large variety of raptors and water fowl may be viewed along the shoreline including White Pelicans, Golden and Bald Eagles, Western Grebes, Cormorants and many species of ducks. The well maintained gravel East Shore Ranch and Fire Acess Road allows public access for almost six miles of the shoreline starting from the Knoxville-Berryessa Road and extending south to a turn-around loop. The area between the road and the water is the Lake Berryessa Wildlife Area. The road provides public access to the Wildlife Area as well as ranch and fire access. 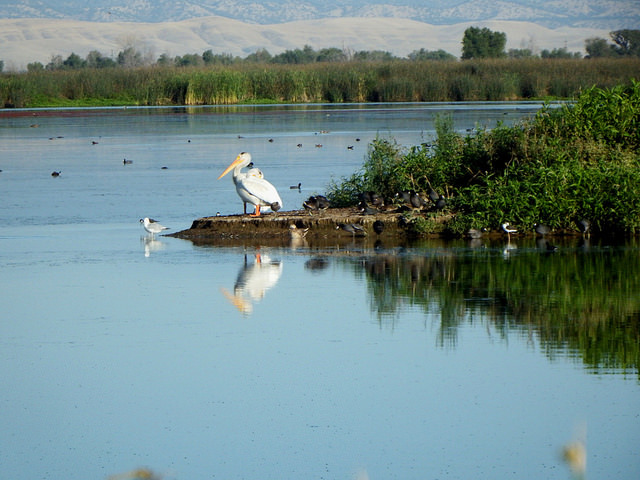 The Wildlife Area extends south from the end of the gravel road to the dam and is accessible by foot and by boat. There are two pedestrian access gates through the fence that runs on the lake side of the road. The first gate (labeled E1) is 0.2 miles from the Knoxville-Berryessa Road and allows access to the northern end of the Wildlife Area. Parking is available across the gravel road and a short distance to the north of the gate. The second gate (labeled E14 - see photo above) is 5.5 miles from the Knoxville-Berryessa Road and allows access to the middle of the Wildlife Area. Short trails lead from each gate to the shore. Note that the somewhat confusing "Closed Area" signs (see photo below) mean only that the area behind the sign is closed to off-road vehicle use. Unless otherwise noted, foot access is allowed and hikers are welcome. All of the land to the east (away from the lake) side of the road is private property and not open to the public. The ranch houses are not appropriate sources of information, water or bathroom facilities; contact the ranchers only in case of a real emergency. South End: Launch from Steele Canyon or Capell and explore the many coves along the south end of the lake including Capell Cove, several coves on the way to The Narrows and the long interesting coves off the north end of The Narrows. Paddle distance from the Capell launch point and the entrance to The Narrows is 4.5 miles. The Narrows: Launch from Markley and explore The Narrows, the waters between the main lake and the dam. Dramatic cliffs rise on both sides near the dam giving way to high ridges closer to the lake. Several long side arms to explore. Paddling distance for the length of The Narrows from the main lake to the Capell launch points is 7 miles. Best paddling is during the winter rainy season and Spring when the lake is full, the hills are green and there are few motorboats. Warm weekends in April and May can get busy. A wetsuit is a good idea during the winter when the water is cold. Note: Between Memorial Day and Labor Day, weekends are busy and noisy with many boats and jet skis. In particular, the middle of the main lake can be dangerous for paddle craft due to operation of very high speed motorboats. Paddling along the shoreline or in one of the side arms of the lake is preferable during these summer weekends. Best summer paddling is on week days when the lake is quieter and much less busy. As water is released from the lake during the Summer for irrigation in Solano County, the lake level drops typically 20 feet by Fall. This exposes a rock and mud ring around much of the lake which is quite scenic in the rocky areas. Fall is good for paddling with few boats, cooler temperatures and Fall colors on the surrounding hills.